Toffee Pudding Co. Garnishes not included. The New Year’s diet starts tomorrow, but today we’re celebrating with the new Warm Chocolate And Almond Pudding from the Sticky Toffee Pudding Company, a NIBBLE Top Pick Of The Week. These English “puddings” are steamed cakes. Steaming—instead of conventional baking—creates a super-dense and super-moist cakelike dessert that is simply irresistible. One can only wonder why steamed puddings haven’t replaced the ubiquitous chocolate lava cake on restaurant menus. 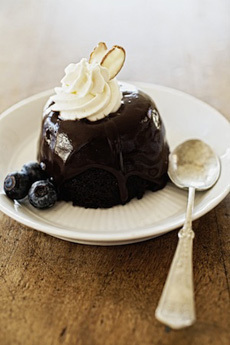 The individual puddings are easy to heat in their ovenproof containers in a microwave or conventional oven. More good news: The desserts are shelf stable, although refrigerating upon arrival is recommended to extend the shelf life. The puddings can be refrigerated for four weeks, and freeze beautifully for up to 6 months. Plan ahead and you’ll always have a pudding in the fridge or freezer when you need a great dessert. If you owe someone a belated holiday gift, he/she won’t complain that these arrived late. Six individual puddings are $30.00 at StickyToffeePuddingCompany.com. Read our review of the Sticky Toffee Pudding Company. Find more of our favorite desserts and recipes in our Gourmet Desserts Section.